Programmatic, A.I., and Big Data are some of the industry's hottest buzzwords and the future of talent acquisition. In 2017, nearly 75% of all digital display ads in the US were transacted programmatically, compared to only 25% in 2012. By 2020, experts predict nearly all of recruitment advertising will be programmatic. 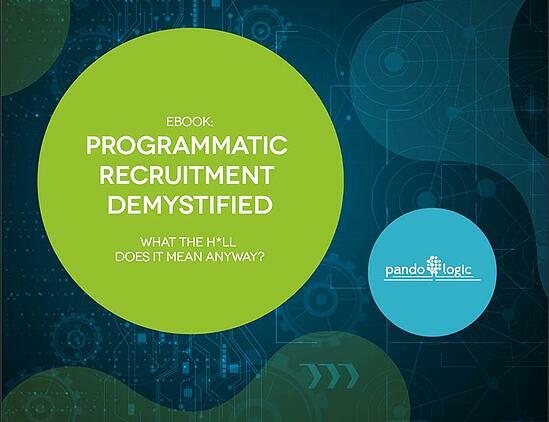 Get access to this ebook to learn about the industry switch to programmatic and how it will transform your recruitment strategy. Programmatic basics: What it is and how it works. How programmatic automates and optimizes every step of the job ad process: Big data analytics, job ad targeting, dynamic budget allocation and bidding, and campaign optimization makes the whole process of sourcing candidates easy, effective, and efficient. The power of programmatic recruitment advertising: How machine learning and A.I. will help you make cost-effective and time-efficient job ad spend decisions. Plus, so much more. How programmatic will transform your recruitment strategy: Switching to programmatic recruitment will help you spend more time focusing on the candidates who are qualified and reducing your time-to-hire.